68″ discharge height, 15″ reach. Unit designed to accept and discharge a wheeled plastic cart of yogurt and cottage cheese containers. Loading skip accepts carts manually rolled in at floor level. 304-2b stainless steel tubular frame with mill finish and continuous TIG welds. 304 stainless steel skip, continuous TIG welds, 2b finish on product contact surfaces. Bolt down stationary design for indoor use. System accepts FDA approved hydraulic fluids and pivot point lubricants. 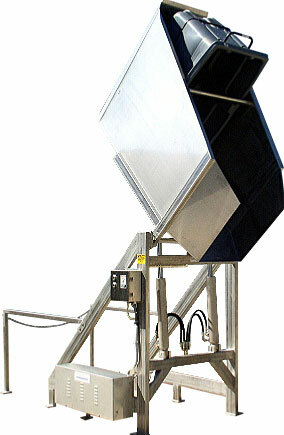 Unit includes a stainless steel hold down system to prevent excessive movement of cart during the discharge cycle. Electroless nickel plated hydraulic cylinders with chrome-plated rods. Allen-Bradley electrical components and Hoffman NEMA 4X enclosure. System designed for momentary contact operation. 3 HP Baldor TEFC paint free, stainless steel motor. 3 GPM fully self-contained hydraulic system housed in a stainless steel enclosure.